Introduction: Tethered cord symptom complex, originally described by Brickner, presents with protean clinical manifestations. It is rare, and we have reviewed our experience in diagnosis, management, and outcome of these patients. Materials and Methods: Patients presented with tethered cord syndrome at our neurosurgery department between 2007 and 2011 were analyzed and reviewed. Results: Thirty cases of tethered cord syndrome were treated surgically over a period of 5 years. The clinical onset was insidious. The main clinical findings were neurological, skeletal, urological, and cutaneous manifestations. M.R.I. was the best diagnostic tool. T1-weighted sagittal and transverse images were useful. Untethering of cord was achieved in 30 cases, in which the filum terminale was divided in 10 patients. There were no serious post-operative complications. The mean post-operative follow-up was 9 months. Most of the patients had an improvement or an arrest of the progress of the symptoms. Patients with shorter duration of symptoms had a better prognosis. Conclusions: Surgery for tethered cord is safe and effective in experienced hands. Early diagnosis and surgery when deficits are less severe the improvement is more likely. Tethered cord symptom complex was originally described by Brickner in 1918. Chute in 1921 described the involvement of the bladder in some types of spina bifida. , The incidence of neural tube defects is 0.17-6.39 per 1000 live births worldwide. There has been a decline in incidence over the past 20 years, largely due to folic acid supplementation, termination of pregnancy after prenatal diagnosis. Tethering of the spinal cord can occur from a thickened filum terminale, scarring due to myelomeningocele repair, lipoma, or diastematomyelia. The clinical manifestations of the tethered cord are protean and commonly by motor and sensory dysfunction of the lower extremities, urinary and bowel incontinence, and orthopedic deformities. M.R.I. offers the ready diagnosis. , We have reviewed our experience in diagnosis, management, and outcome of these patients. Between 2007 and 2011, 30 patients presented with tethered cord syndrome at Department of Neurosurgery, Government General Hospital, Kurnool. All the case notes were thoroughly reviewed and analyzed. Of the 30 patients, 16 were males and 14 were females. Their ages ranged from 10 months to 35 years with a mean age of 11.4 years. The common clinical presentation was lower extremity pain, lower extremity weakness, sensory disturbance, and bladder dysfunction [Table 1]. 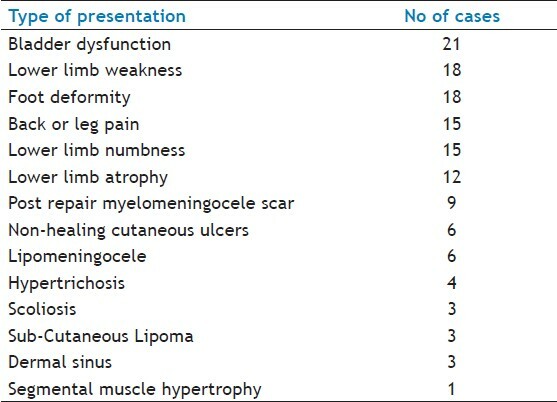 Thirteen patients presented with back lesion in the form of lipoma, hypertrichosis [Figure 1], and lipomyelomeningocele. Nine had previously undergone surgery for myelomeningocele closure immediately after birth. Eighteen had foot deformities in the form of equinovarus. Six patients presented with non-healing ulcers on the feet [Figure 2]. One patient presented with hypertrophy of calf muscle on one side. 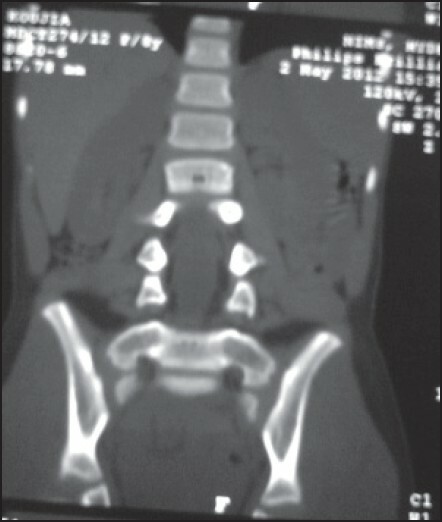 Plain radiography of their spine showed spina bifida in 15 out of 30 (45.5%), and rest of patients had no abnormality in the spine [Figure 3]. All patients had M.R.I., and Low conus were seen in all patients [Figure 4]. Thirty patients had untethering, and 10 of them also had division of filum terminale. All patients had low conus below L2. Thickened filum terminale was found in 10 patients (40%), lipomeningocele and adhesions of nerve roots to dura in 9 patients (30%), post-repair myelomeningocele adhesions in 6 patients (20%), aggregation of root bundles and adhesion of nerve roots to dura in 3 (10%), 3 cases with type I and type II split cord malformations as cause of tethering [Figure 5] and [Figure 6]. The mean post-operative follow up was 9 months. Twelve cases presented with back pain had relief of pain, 12 patients had improvement of motor symptoms, 6 patients had improved in sensory symptoms, 12 patients had improved control of bladder, ulcers healed in 4 patients, and none of the patients showed worsening of symptoms [Table 2]. There were 5 cases of C.S.F. 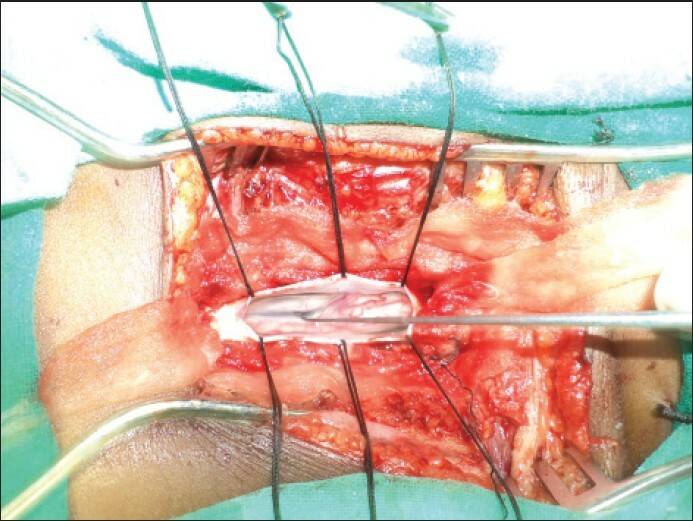 leak in the immediate post-operative period; this was controlled with reinforcement sutures. Tethered cord syndrome (TCS) is most commonly seen in children, but adults have also been affected. The onset of symptoms of TCS has been reported to be more common during growth spurts. The cord reaches the adult level of L1-L2 in most of the persons by approximately 2 months after birth. A conus level lower than mid-L2 vertebral level is generally accepted as abnormal. Normal filum thickening is stated to be 2 mm or less. Surgery for tethered cord is safe and effective in experienced hands. Early diagnosis and surgery when deficits are less severe the improvement is more likely. Any infant having a midline lumbar cutaneous anomaly such a lipoma, hair patch, or sinus should be evaluated to rule out tethering of spinal cord. In any differential diagnosis of the etiology of the urinary incontinence in children, one must include the tethered cord syndrome. Segmental muscle hypertrophy is an unusual finding in tethered cord syndrome. Healing of cutaneous ulcers after untethering is a significant finding. I thank Professor Dr. W. Seetharam. M.Ch., for his suggestions and review of this paper and Dr. Ananth. M.Ch., DR. B. Nagaraju. M.Ch., Dr. Venkateswararao for preparing the manuscript. 1. Brickner WM. Spina bifida occulta. Am J Med Sci 1918;155:473-502. 2. Adamson AS, Gelister J, Hayward R, Snell ME. 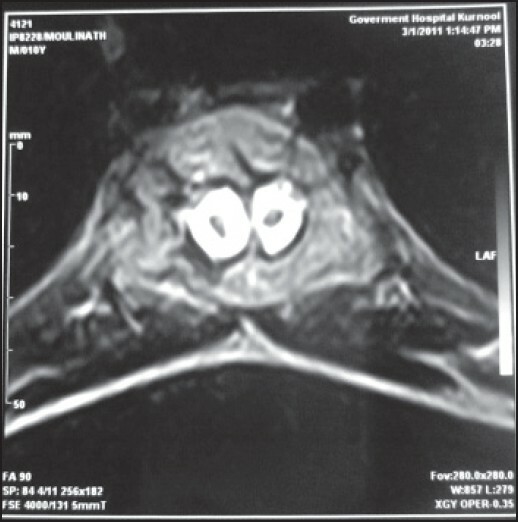 Snell Tethered cord syndrome: An unusual cause of Adult Bladder Dysfunction. Br J Urol 1993;71;417-21. 3. Chute AL. The relation between spina bifida occulta and certain cases of urinary retention. J Urol 1921;5;317. 4. Bowman RM, McLone DG, Grant JA, Tomita T, Ito JA. Spina bifida outcome; a 25 year prospective. Pediatr Neurosurg 2001;34:114-20. 5. Pang D, Wilberger JE Jr. Tethered cord syndrome in adults. J Neurosurg 1982;57:32-47. 6. French BM. Midline fusion defects, and defects of formation. In: Youmans JR, Editor. Neurological Surgery, 3 rd ed, Chapter 39. Philadelphis. W.D. Sunders; 1990. p. 1081-235. 7. 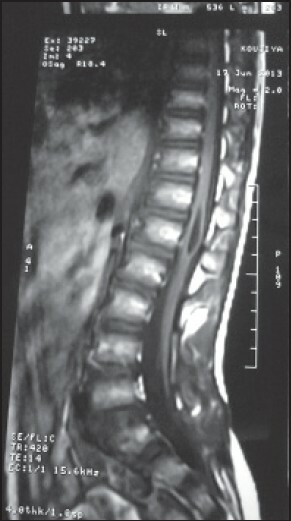 Raghavan N, Barkovich AJ, Edwards M, Norman D. MR Imaging in tethered spinal cord syndrome. AJR Am J Roentgenol 1989;152:843-52. 8. Warder DE, Oakes WJ. Tethered cord syndrome the low lying and normally positioned conus. Neurosurgery 1994;34:597-600. 9. Barson AJ. The vertebral level of termination of the spinal cord during normal and abnormal development. J Anatomy 1970;106;489497. 10. Fitz CR. Harwood Nash DD. The tethered conus AJR Am J Roentgenol 1970;125:519-23. 11. McLone DG. The subarachnoid space-a review. Childs Brain 1980;6:113-30. 12. Filler AG, Britton JA, Uttley D, Marsh HT. Adult post repair myelomeningocele and tethered cord syndrome. Br J Neurosurg 1995;9:659-66. 13. Tamaki N, Shirataki K, Kojima N, Shouse Y, Matsumoto S. Tethered cord syndrome of delayed onset following repair of myelomeningocele. J Neurosurg 1988;69:393-8. 14. Düz B, Gocmen S, Secer HI, Basal S, Gönül E. Tethered cord syndrome in adult. J Spinal Cord Med 2008;31:272-8. 15. Yamada S, Zinke DE, Sanders D. Pathophysiology of tethered cord syndrome. J Neurosurg 1981;54:494-503. 16. Yamada S, Won DJ. What is the true tethered cord syndrome. Childs Nerv Syst 2007;23:371-5. 17. Bertorini T, Woodhouse C, Horner L. Muscle Hypertrophy secondary to the tethered cord syndrome. Muscle Nerve 1994;17:331-5.